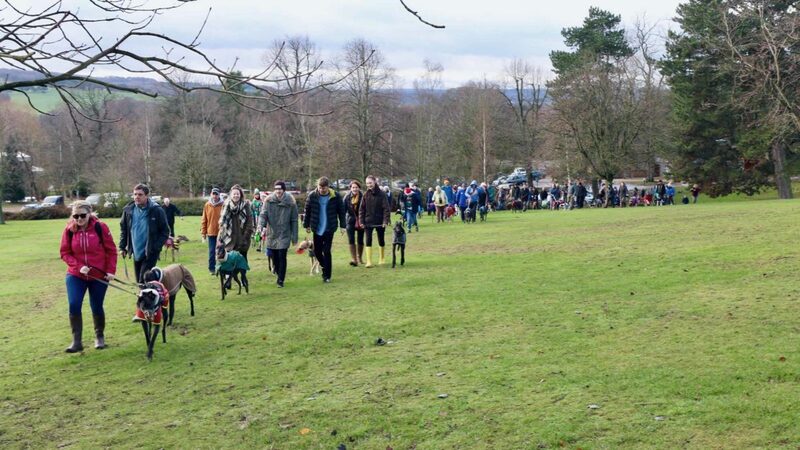 On Sunday 9th December we had our second Sighthound Social Club Santa Paws Walk at Yorkshire Sculpture Park – and with 92 dogs it was truly PAWSOME! Thank you to everyone who came along and enjoyed a walk in the sunshine with us. We want to say a HUGE SSC Thank You to Santa’s elves from Treats2sit4, who gave every hound a Christmas box of treats! Our Santa’s Paws walk at Yorkshire Sculpture Park would not have been possible without Andrea Littledyke and the YSP team and we would like to thank them for their continued support and good will. This year’s response to our Christmas Shoebox Appeal was amazing! We were overwhelmed by your generosity with 213 shoeboxes, not to mention the dog food, beds, duvets and collars. We would like to say a huge “Fank Roo!” to everyone who donated and to Team Pointy in York and Hounds of Twitter for supporting the appeal. This meant that we were able to give a shoebox to each of the hounds in our chosen charities and rescues. That’s a lot of happy hounds! Let’s hope they all find a forever home in 2019. We wish you and your hounds a Merry Christmas and a Happy New Year from all of us at Sighthound Social Club! We hope to see you at our New Year’s Day Walk on Tuesday 1st January at Roundhay Park in 2019.